Fox and friends’ attack on Kermit and friends is sillier than one of Fozzie Bear’s jokes. Kermit and friends are money in the bank for Disney. Kermit the Frog is, like money, the color green, and he would seem to be a capitalist – even if, as evidenced by his new movie, “The Muppets,” it’s not so easy. The film portrays Kermit as an entrepreneur struggling to revive a flagging business in a tough economy, using sweat equity and private donations instead of seeking a government bailout to create (or recreate) jobs – even if Muppets presumably don’t turn up in the employment statistics. Fox’s case-in-point is the delightful movie’s cartoonish villain, Tex Richman (read: “rich man”), a ruthless oil baron bent on destroying the Muppets’ shuttered theater to get to the Texas tea below. Forget that the archetype, played here with over-the-top Snidely Whiplash-like glee by Chris Cooper, predates the movies, never mind the Muppets. One “Follow the Money” guest went as far as partially blaming liberal messages fed by Hollywood to the masses since birth for the Occupy Wall Street movement. “They’ve been indoctrinated literally for years by this kind of stuff,” Dan Gainor of the Media Research Center told Fox’s Eric Bolling (see the clip via Media Matters). 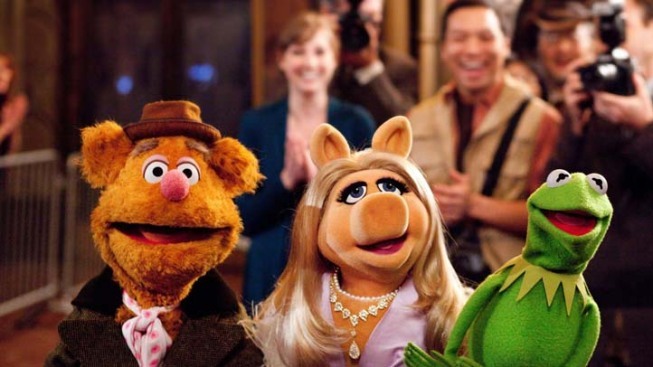 The Muppets, undeniably, are being increasingly appropriated for political satire (“Gitmo” on “The Daily Show”) and as symbols of movements (Ernie and Bert as the poster-puppets for gay marriage, Cookie Monster as the furry embodiment of the “one percent”), to varying degrees of effectiveness and silliness. The Fox show’s latest twist in the practice of using Muppets as political puppets falls into the silly category – it's as laughable as one of Fozzie Bear’s jokes. If you’re bent on seeking a message, look no further than the title of the bouncy Bret McKenzie-penned theme tune “Life’s a Happy Song,” which seems a pretty optimistic notion. They’re likely singing a happy song at Disney – a fairly large capitalist operation last we checked – with “The Muppets” pulling in more than $56 million so far. But as much as we loved the alternately touching and hilarious exercise in nostalgia for those of us who grew up on “Sesame Street,” the flick likely will never come close to the nearly $2.8 billion reaped worldwide by “Avatar” – a film with a clear pro-environmental agenda that rankled some conservatives. The story of the battle to save the good blue folks of Pandora from the bad, natural-resource-stealing capitalists happened to be produced by 20th Century Fox. Between the blue and green and the masses who plunk down hard-earned money for some escapism, there’s plenty of opportunity for a rainbow – and capitalist – connection. Like Kermit, we can at least dream.